Eric needed to work on the wiring (wiring being a cover all term for getting the boat working) and we decided it would be more efficient if I weren’t on the boat. Read into that what you like but I wasn’t going to argue and took myself off by train to see mum for a few days. 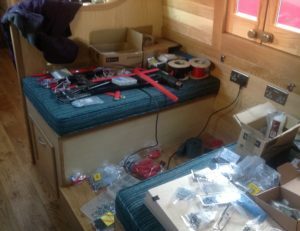 Of course when I returned the wiring was still in progress and the dinette looked somewhat different to how I envisaged. 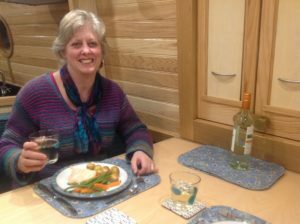 But it didn’t take long for it to return to how a proper dinette should look. Actually having been so desperate to get back to the boat, the first thing we did was take a nice long walk while the sun was shining. But in my haste I forgot my camera. 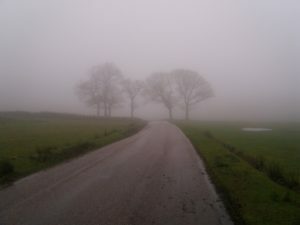 We retraced our steps up to Lyme park and after last weeks mist, yes I can confirm the view was stunning. And progress has been made on the wiring, I am told that the motor does work despite the morse controller having been configured the opposite way to how we need it. So we’ll be going forward in reverse…..
One of the things that makes modern living what it is, is being connected to the Internet and having access to information at our fingertips. Rightly or wrongly we view it as an essential. So whilst the TV and Radio are still waiting their fine tuning and we have had a quiet weekend without them Eric has been sorting out the internet access and on board WiFi. 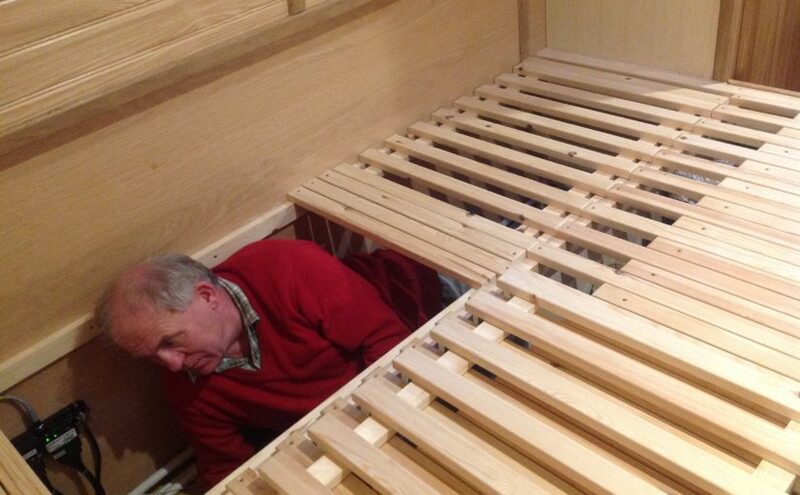 The router is housed under the bed which means it’s accessible if necessary and the WiFi signal isn’t hampered by too much metalwork so that our connection is good in both the saloon and dinette. We’re now conscious of paying for the time we spend browsing and we’ll have to top up regularly until we can decide the best monthly contract to use. It will seem expensive at first but when you consider the true cost of paying line rental etc. on dry land, it’s just that we are conditioned to absorb those costs without thinking much about it. Time will tell as to how many hours we can waste on YouTube before we realise we can’t check the weather forecast or make blog posts. We’re also taking advantage of the families BT home hub system so when we do feel the need for a little moving action we’ll choose our mooring spot more carefully. As with all the things on Firecrest we’re not actually cruising yet and a lot of our technology is still to be put to the full test, hopefully for Eric’s sake it will work otherwise it’ll be back under the bed for him until it is right. Two days in and we’re still grinning, despite the rain sleet and mud. The boat is warm and cosy and the condensation is negligible. I haven’t tried to unpack properly yet as there is still the small issue of getting the motor commissioned, that is Eric’s job for next week. So it all still feels like we’re camping. The moment the rain stops we don the boots and woolly hats and set off to walk. It’s the weekend so there’s plenty of people about with the same idea as me. But all the rain has made for some very muddy puddles. I don’t like mud. It’s slippy and I feel unsafe and I’ve decided that I’m going to avoid muddy walks wherever possible. 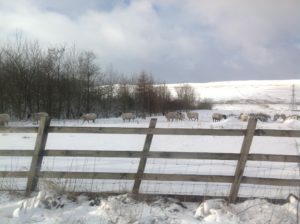 Hence today’s walk took us on a proper track up to Lyme park. 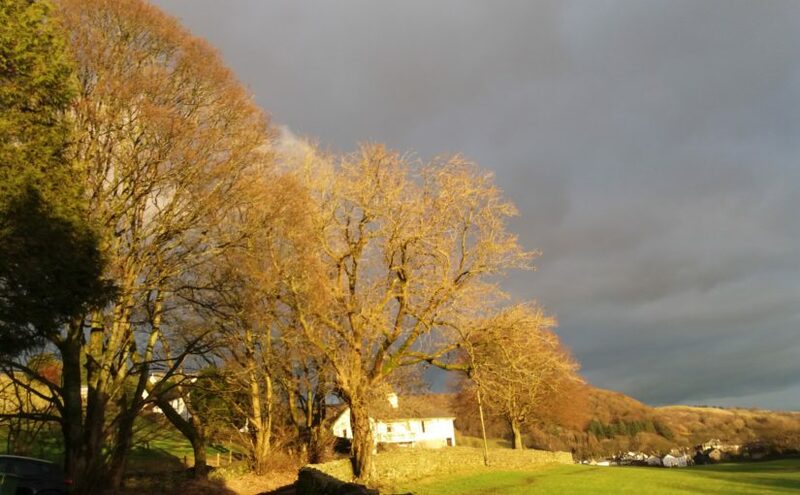 This country house is a national trust property set on the hill as the crow flies between here and Whaley bridge. I’m told the views are magnificent, you’ll have to decide whether or not to believe me. 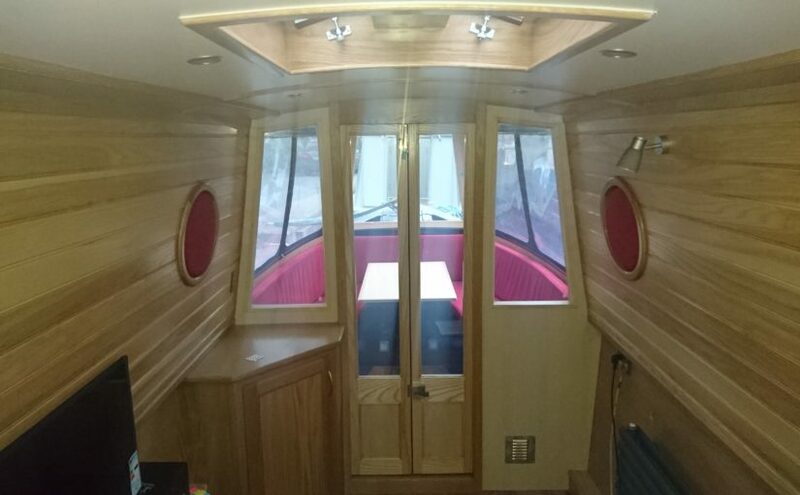 I wish it were easier to photograph the interior of the boat but the grey weather and reels of cables don’t do it justice so you’ll have to be patient for a bit longer. 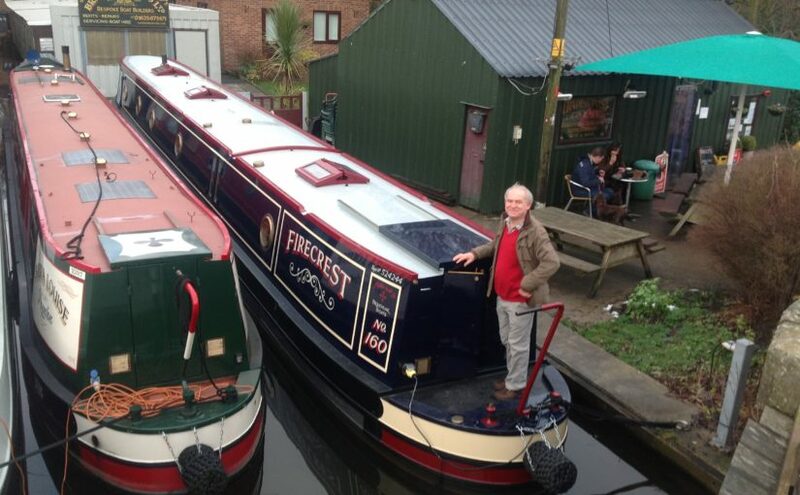 Today we moved on board NB Firecrest. It’s been an overwhelming day and I hardly know where to begin sharing our joy with you, but so many people have been wishing us well today and are keen to hear that we are settled, I shall give it a go. The day started yesterday when we waved goodbye to Suffolk. We set off for an overnight stay in bed and breakfast so we’d be able to get to Braidbar bright and early. We didn’t expect the day to dawn bleak and grey with snow falling heavily, and the car spent more time skidding backward than moving forwards. Luckily a Good Samaritan helped push us up over the hill so we could escape and we arrived before lunch. Firecrest was looking resplendent in the sunshine with just a little snow left on her roof. 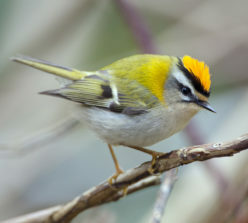 It was the first time I’d seen Firecrest since October and I haven’t stopped smiling since. 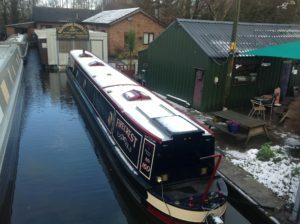 The heating is efficient and quickly warmed the boat up although carrying bags from the car made sure we weren’t cold. 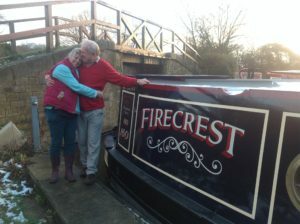 James and Donna give us a brief handover as Eric’s been working on the boat so much he’s already familiar with most of it. And then we were left to settle in. We’ve spent most of the day relaxing and enjoying the atmosphere, it feels comfortable and cosy and full of promise for a long future. Tomorrow we’ll think about unpacking and deciding where to store everything. But tonight it’s steak and chips for tea and time to crack open the bottle of champagne we’ve been saving. Moving our belongings from house to boat was always going to take a bit of planning, but as we’ve been lucky enough to have a phased handover we’ve been able to transport everything by car. 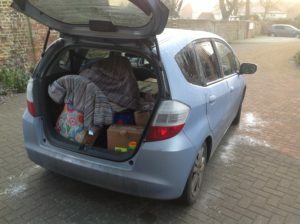 If it weren’t for the bulky items, 2 armchairs and foot stools, we’d have probably got away with just one car load. 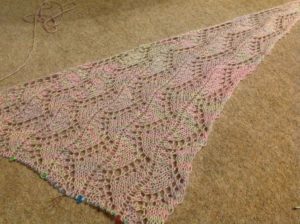 Instead it will be 3, the final journey being reserved for me, my clothes and craft items. But more on that later. 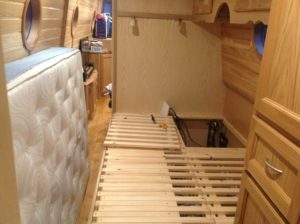 This boat has been designed around me having enough storage space to keep me busy with craft and hobbies to last a lifetime. Eric will have to take refuge in the engine bay and polishing the brass. I’m keeping my fingers crossed that the finishing touches will be completed soon after the yard reopens in January. New photos added to the gallery showing the cushions that arrived this week for the dinette, canopy and bedroom. 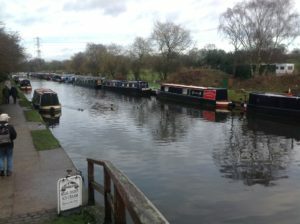 Many years ago, on a lazy summer afternoon we moored up our hire boat at Braunston and meandered around the marina. Spotting the for sale signs, we peered through the window of a 60 foot beauty. Wow, this isn’t anything like the hire boat. The owners were aboard and invited us in to have a closer look. We realised with a bit of jiggling around, we could just about afford a boat of our own, but we still had the house to renovate, the kids to educate and the jobs to manipulate, the time just wasn’t right. 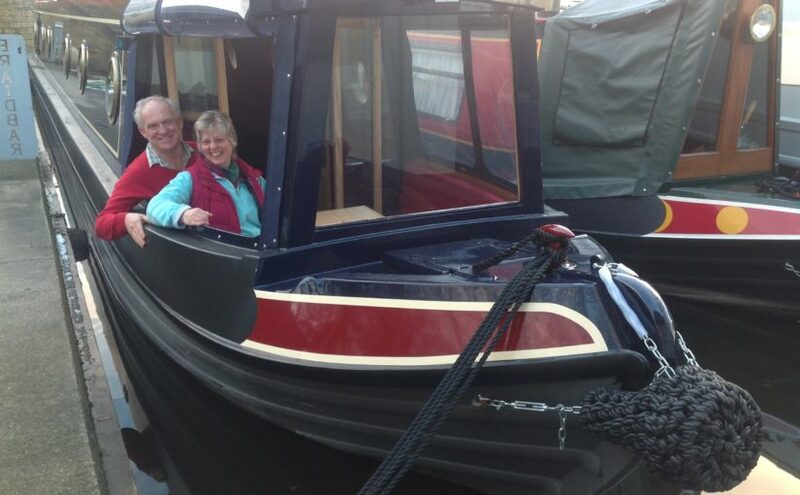 We moved on and continued our holiday, but the seed had been well and truly sown, one day we would live aboard a narrowboat.